Rephidim is also called Massah (test) and Meribah (quarrel). Rephidim is a large wilderness area of about 1000 sq. km.. There are two different places called "Meribah" in the exodus route: The first is here at Rephidim before they got to Sinai. The second is at Kadesh Barnea where Moses sinned in striking the rock and taking glory for himself. Note: there are two different Meribah's in the Bible. One at Mt. 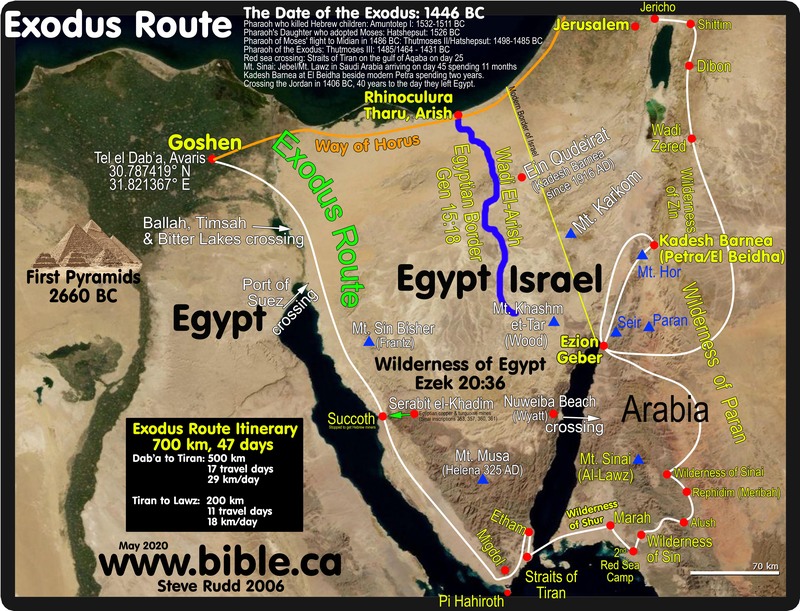 Sinai and the second at Kadesh. Rephidim is an important stop in Hebrew history. Three key events occurred at Rephidim: Complaint of no water: Ex 17:1-7; Amalekites attacked Israel and Moses climbed a hill and held his hands up in the air: Ex 18:8-16; after winning the battle, Moses built a memorial altar: Ex 17:15. Rephidim is an important in determining the exodus route. It is only one stop next to the wilderness of Sinai. This means that Rephidim and the Wilderness of Sinai must be on the same (east) side of Mt. Sinai, or in close proximity. 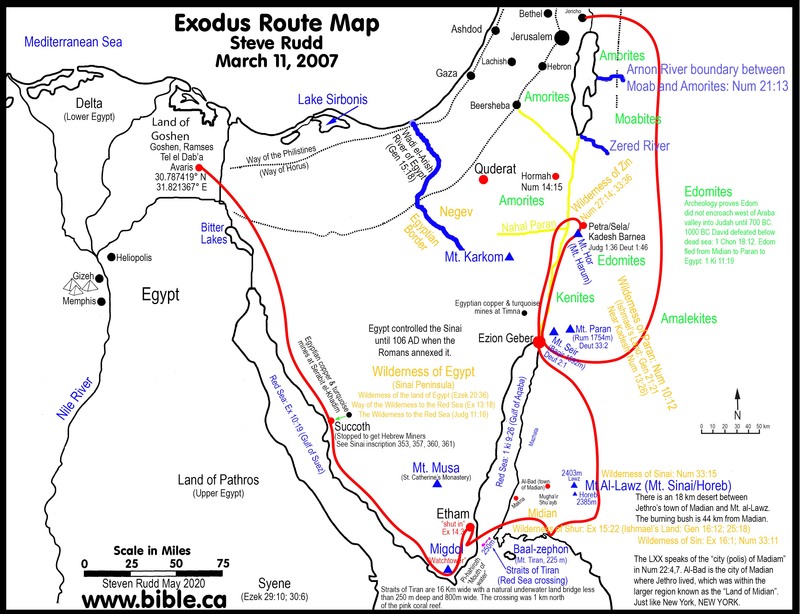 Some have wrongly proposed exodus routes to Al-Lawz that place Rephidim on the west side of the mountain, and the wilderness of Sinai on the east side. The shortest possible route would be 50 km around the mountain range where the width is often between 100 - 300 meters wide in the valleys between hills. Then you come to the last 12 km, which would be considered difficult rugged terrain. It was between the wilderness of Sin and Rephidim (Meribah) where the staging occurred because of rugged narrow territory. The staging ended at Rephidim and they easily entered the wilderness of Sinai. If Rephidim and the wilderness of Sinai are on opposite sides of the mountain range, this cannot account why the staging stopped at Rephidim, when it should have continued in stages all the way to the wilderness of Sinai. A more easier, but longer route would be 70 km. This route is generally much wider, but still has a few places where the width of travel narrows to 100-200 meters. Another problem with either the longer or shorter routes around Mt. Lawz, is the time involved. They only have 20 days to get from the Red Sea to Mt. Sinai. A trip of 50 -70 km through semi difficult terrain might take from 3-7 days, considering they would be a long narrow line through the valleys. In short, there is only one stop between Rephidim and the wilderness of Sinai yet many days of travel. It just doesn't fill well with the record. However, placing Rephidim and the wilderness of Sinai beside east other west of Lawz, fits perfect. 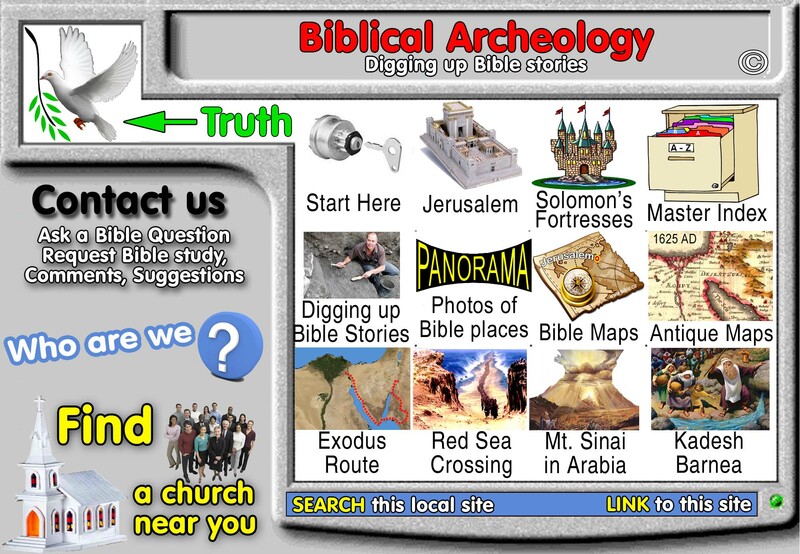 This gives us important information about the type of terrain between Sin and Rephidim. There is only one reason they would travel by stages, and that is because they could not travel as one group because of the terrain. 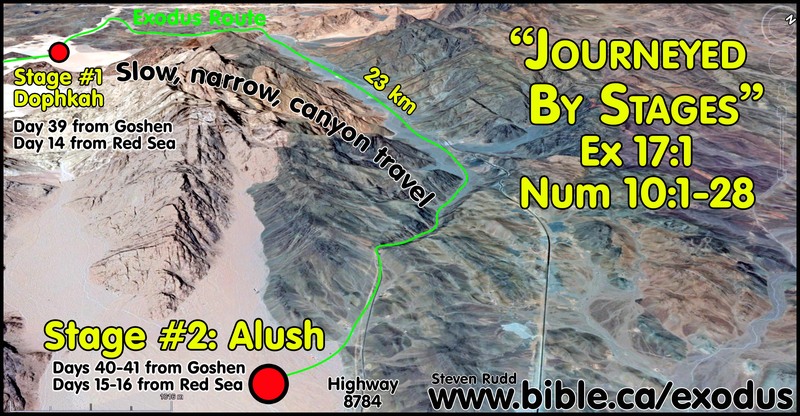 In fact, from the time of leaving Goshen in Egypt, this is the first time they had to travel by stages. There is a wide coastal plain 300 km long down the east coast of the Gulf of Suez. After crossing the Red Sea at the Straits of Tiran, there is another wide open plain they could walk on until they get to the Wilderness of Sin. Between the wilderness of Sin and Rephidim are a number of narrow valleys about 200 meters wide. It is also more rugged and hilly. This would restrict the movement, so the Bible is right, they couldn't all go at once, but in stages between the two wildernesses plains. Amazing confirmation of the accuracy of the Bible story. Here is a view of the difficult terrain between the wilderness of Sin and Rephidim. Here is a view from Alush. The hill where Moses stood is 25 km from Alush. The wilderness of Sinai is 700 sq. km.. Israel had to walk from the camp and be ready for God to descend the third day which would be Pentecost Sunday. In Ex 17:1-7 the people grumbled for water and tested God. Therefore the two other names of this location are: Massah (test) and Meribah (quarrel). The Bible does not say the rock split in two when Moses struck it. Some have created wild speculations by specifically identifying the rock Moses struck merely on the physical appearance of being split in two. Problem is, this must be wrong, because this rock they chose locates Rephidim on the east side of Al-Lawz, when it is actually on the west side. Note: there are two different Meribah's in the Bible. One here Mt. Sinai and the second at Kadesh. The sequence in the Bible is that the people grumbled in Rephidim, then Moses took the people in one day to the wilderness of Sinai, then Moses had to walk to the foot of Mt. Sinai and struck the rock for water. This means there is a 3 day delay between the time Israel grumbled for water, before they got it. The Bible clearly indicates that they journeyed from Rephidim to the wilderness of Sinai, then to the foot of mount Sinai. It is highly unlikely that Moses would journey the entire trip to Mt. Sinai to bring water from the rock, then to walk back to Rephidim to fight the Amalekites, only to retrace his steps again with the entire camp. Another reason this is unlikely, is that Israel would then need to repeat the journey to get the water, then return to fight the Amalekites. This would add another 3-4 days to the journey, that cannot be accounted for. So the obvious scenario is that they grumbled at Rephidim, then fought the Amalekites, then Moses build the altar at the foot of the hill he stood on, then journeyed to the wilderness of Sinai with the whole camp. Only then did he make the first trip to the foot of Mt. Sinai to strike the rock and bring water out for Israel to drink. 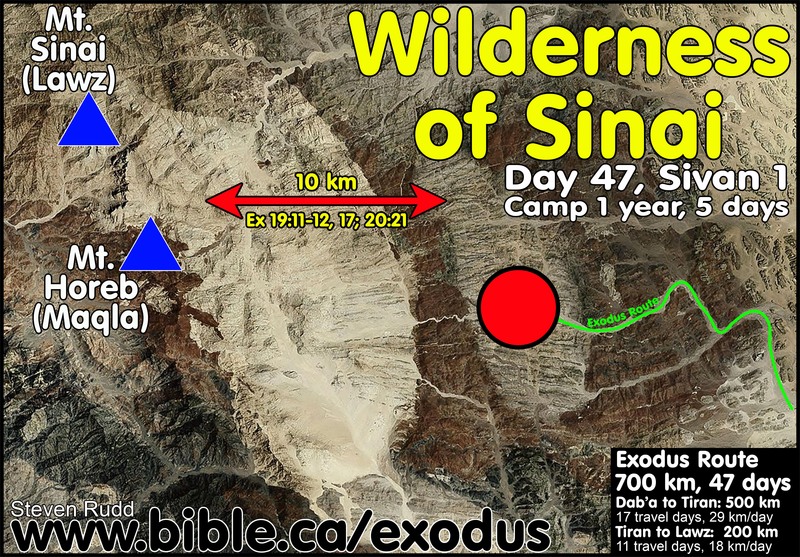 Another reason Rephidim must be directly beside the wilderness of Sinai is the grumbling about no water. They grumbled at Rephidim, but Moses struck the rock to bring water out at the foot of Mt. Sinai. 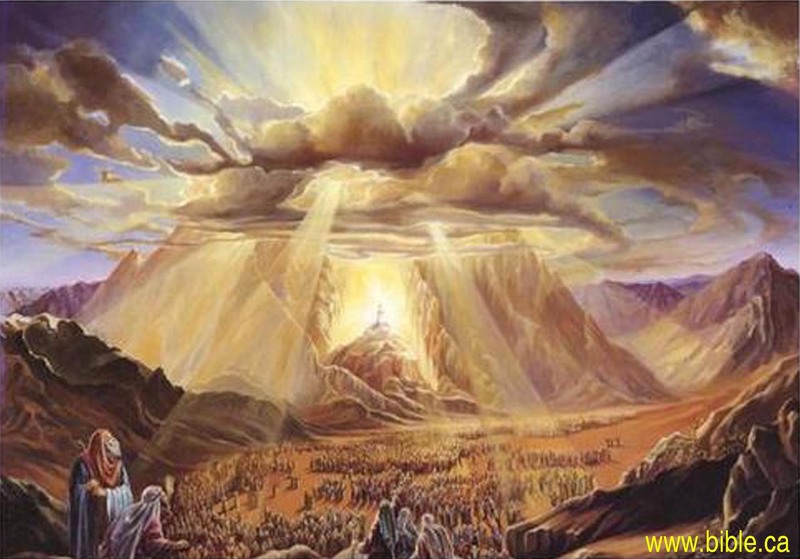 If Rephidim and the wilderness of Sinai are on opposite sides of the mountain range, then according to the Bible, there are only two possible scenarios, both of which have huge problems. First scenario is that the people complained about water in Rephidim then Moses walked to the foot of Al-Lawz on the same western side of the mountain and struck the rock to give them water. But this make no sense considering they are going to immediately leave this water supply to walk 50 - 70 km around the mountain to the wilderness of Sinai. Second scenario is that the people complained about water in Rephidim then Moses journeyed that walked to the 50 - 70 km around the mountain to the wilderness of Sinai, then to the foot of Al-Lawz to strike the rock for water. This would make the most sense, since Israel spent almost a year there and would need the water. But the second scenario makes no sense because the people might have indeed died of thirst, if they had to walk 3-7 days in the desert, 50 - 70 km around the mountain before getting water. This proves, therefore, that Rephidim must be directly beside the wilderness of Sinai. The Amalekites were a tribe had their origin within the Edomites, being descendants of Esau. They are often associated with Edom, living in the same area as Edom. Their traditional territory is transjordan between Babylon and the gulf of Aqaba. Moses hands were held up to win the battle! Sometimes great leaders need help. Moses climbed up a hill that all Israel could see him. He lifted up his hands and Israel was winning the war. But he got tired and dropped them, which gave Amalek the advantage. 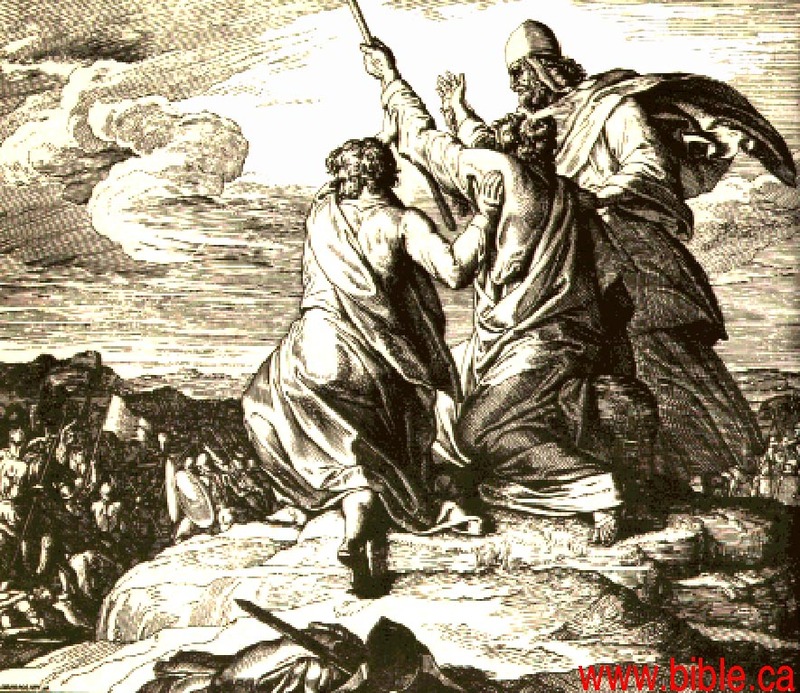 So they held up Moses hands for him and Israel defeated Amalek. What is interesting about the terrain where the battle took place is that Amalek waited till Israel was out in the open where they would easily fight them. We know that the terrain between the wilderness of Sin and Rephidim required them to go by stages and not all at once. So Amalek waited for Israel to an easy target, then attacked. Deut 25:17 says they also ambushed from the rear killing stragglers who fell behind. Those who oppose placing Mt. Sinai in modern Saudi Arabia incorrectly place the territory of the Amalekites in the modern Sinai Peninsula. They argue that is seems unlikely that they would attack Israel in Midian, but very likely to attack if the traditional location of Mt. Sinai is at Jebel Musa. The problem is Saudi Arabia is in fact where the Amalekites lived. It makes perfect sense why the Amalekites would attack once you learn the correct place they lived! They begin by imagining Mt. Sinai is in the same territory as the Amalekites: the modern Sinai Peninsula. In a "comedy of errors" they wrongly assume the Amalekites lived beside the land of Goshen, because they wrongly place the Shur on the east side of the Bitter lakes, instead of in Saudi Arabia. They correctly insist the Amalekites lived near Kadesh Barnea, but then wrongly place Kadesh Barnea within the promised land at Ein el-qudeirat, instead of near Petra, near Mt. Seir in the land of Edom where we know they did live. But their comedy turns to horrors when they learn that the Amalekites were located "from ancient times" between Midian and Babylon, they revise their argument and say that they also dwelt in the Negev of Judah. When they clearly inhabited a territory from Babylon to Midian, some did spill over into the Negev, but the majority of their domain was north central Arabia. We know that the "city of the Amalekites" was transjordan at the time of David. But now that we have learned that the ancient domain of the Amalekites extended to Shur (Midian), we can easily see why they attacked Israel while Moses was at Rephidim, one stop before Mt. Sinai. (Ex 17:8). At the time of David, the Amalekites joined the Midianites to attack Israel. It all makes perfect sense if Mt. Sinai was near Midian and less sense if Mt. Sinai was at Jebel Musa, the traditional location in the modern Sinai Peninsula. The biggest problem with the traditional exodus Route to Mt. Musa in regards to the section between the Wilderness of Sin and Rephidim (Meribah), is that there is no need to "journey by stages". 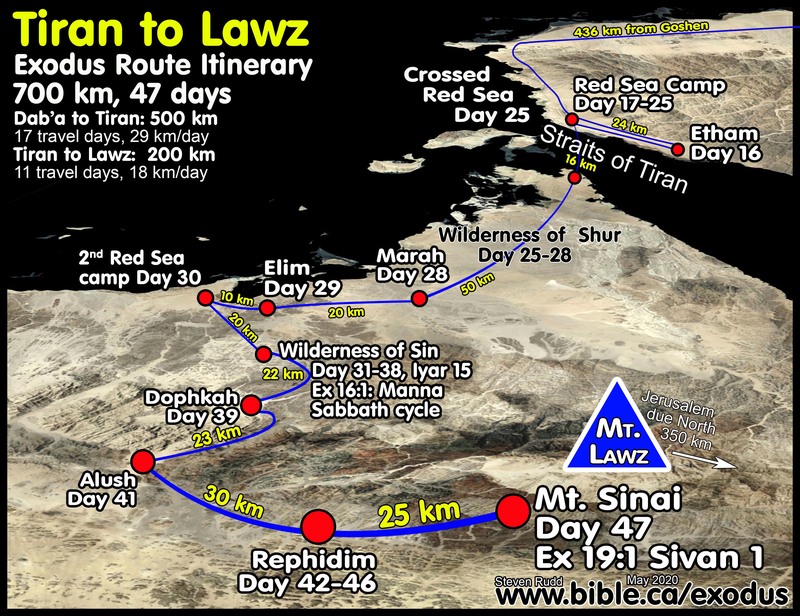 The difficult part of the journey is actually between Elim and the "second Red Sea camp", one stop before the Wilderness of Sin. Once you reach the Wilderness of sin, the terrain becomes easy again till you reach Rephidim (Meribah). Then to the horror of traditional route advocates, the route becomes difficult again between Rephidim (Meribah) and the wilderness of Sinai. Here is a chart of what kind of terrain to expect based on the Bible narrative, and the terrain we find for the traditional route to Mt. Musa, vs the Terrain we find in out route to Jebel Al-Lawz.